استديو مطل على بركة السباحة.
. استمتع بالخدمات الراقية والضيافة التي لا مثيل لها بهذا الفندق في كيرنز. يقدم هذا الفندق العديد من الخدمات الكفيلة بإرضاء أكثر الضيوف تطلباً. في الفندق غرف نوم يتجاوز عددها 192، كلها مجهزة بعناية وجمال وبعضها مزود بـ تلفزيون بشاشة مسطحة, غرفة معيشة منفصلة, اتصال لاسلكي بالإنترنت, غرف لغير المدخنين, مكيف هواء. يقدم الفندق خدمات رائعة كمثل مركز للياقة البدنية, ساونا, حمام سباحة خارجي, سبا, حديقة لمساعدتك على الاسترخاء بعد نهار طويل من النشاط والتجوال في المدينة. مهما كانت دواعي سفرك فإن شقق سازرن كروس أتريوم هو خيار ممتاز لإقامتك في كيرنز. 1. لا توجد مصاعد/مصاعد في مكان الإقامة. لا يوجد سوى درج للوصول إلى الغرف العلوية. 2. نحتاج إلى ترخيص مسبق/سند أمان عند تسجيل الوصول. بالنسبة للشقق الفندقية، تبلغ السند 150 دولارًا أستراليًا، والشقق المكونة من غرفة نوم واحدة 200 دولار أسترالي، والشقق المكونة من غرفتي نوم 300 دولار أسترالي. Great location and is very close to shopping mall and railway station. Staffs are very friendly, they will greet us with a Smile or "Good morning". Room is clean, there is a small equip kitchen with microwave oven and complimentary coffee and tea. Thanks to the young lady at the reception for helping us to check with the Airport Transfer company pickup time for 2 days in a row due to some confusion to mishandle record. We stay for 4 nights and no changing of towels and clearing rubbish. But they left 8 towels for us to use. Have everything needed, easy access to anywhere by walk. We had a great little studio apartment that was spotlessly clean and crisp white sheets and towels. Really couldn't fault it at all. Didn't use pool or anything but would always return as just so nice to stay in somewhere so comfortable. Love the beds too. Cheers. Clean, well kept but VERY noisey facility. 12 blocks with 15 or so rooms in each. The place has been like a mad zoo in school holidays. Pools are a nice touch. Sauna is good quality as well. If you are a working traveller or looking for quiet rest this is not the place to stay. we thoroughly enjoyed our stay at the Southern Cross Atrium, our two bedroom apartment had everything we needed, was close to shops, and only a 10 minute walk to the esplanade. I would definitely stay their again. Although the apartments were clean and comfortable, I was a little underwhelmed with my stay. Set a substantial walk away from the "action", the apartments are nestled between car sales yards and the shopping centre car park. Hardly picturesque. I booked a deluxe room, but it was at the very back of the complex under a staircase. No view, very little atmosphere. Value for money was good, staff were very helpful and professional, but the apartments themselves and the location are not really very exciting. 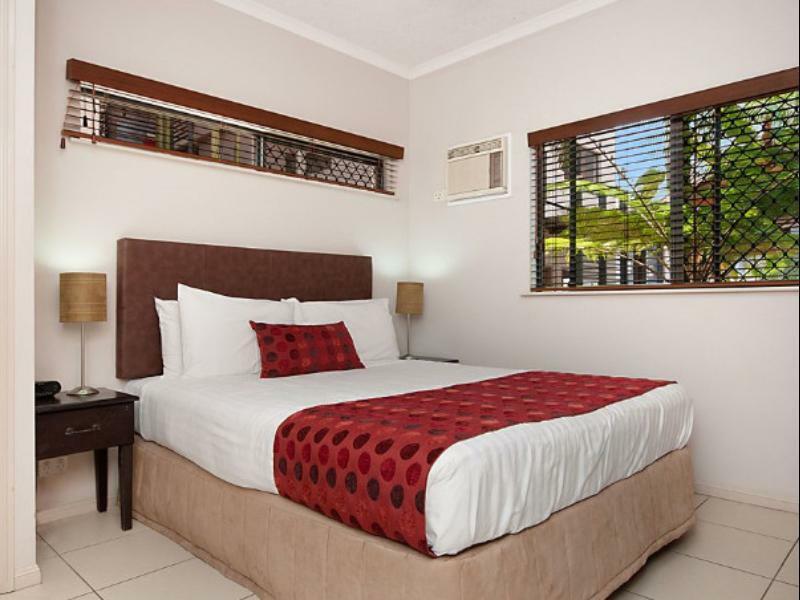 Great location - near shopping centre, walking distance to CBD/waterfront. 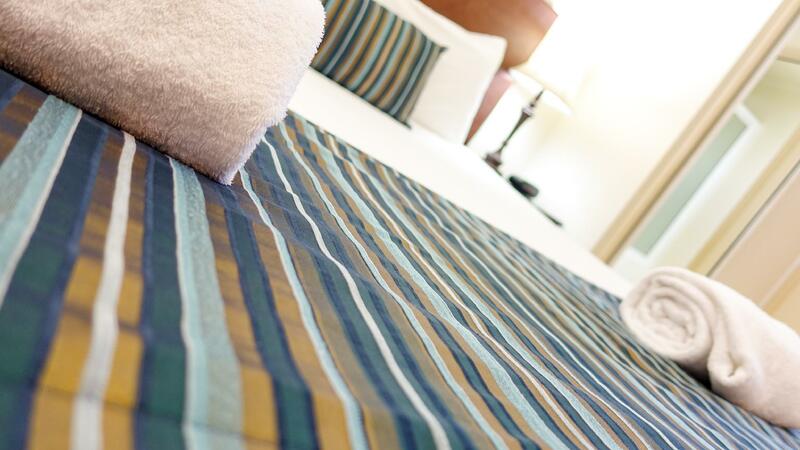 Friendly, welcoming staff and clean, well-equipped room with comfortable bed. Lovely to wake up to the various bird noises. (Shame about the early morning noise from Officeworks - but this can't be helped). We really enjoyed our stay - thank you very much! 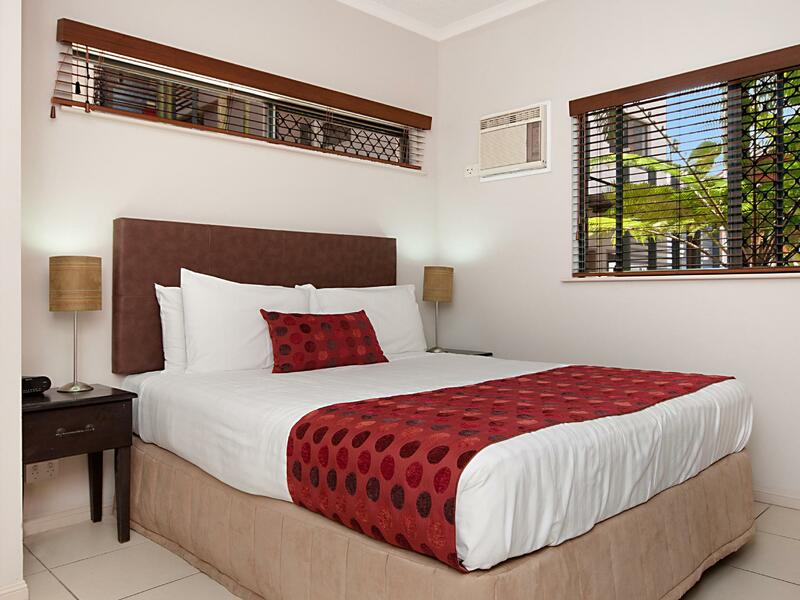 relaxing accommodation and within walking distance to jetty to cruise to the reef . Near shopping and food is not a problem. there is a microwave, electric stove a big refrigerator in the kitchen. A washing machine and clothes dryer . 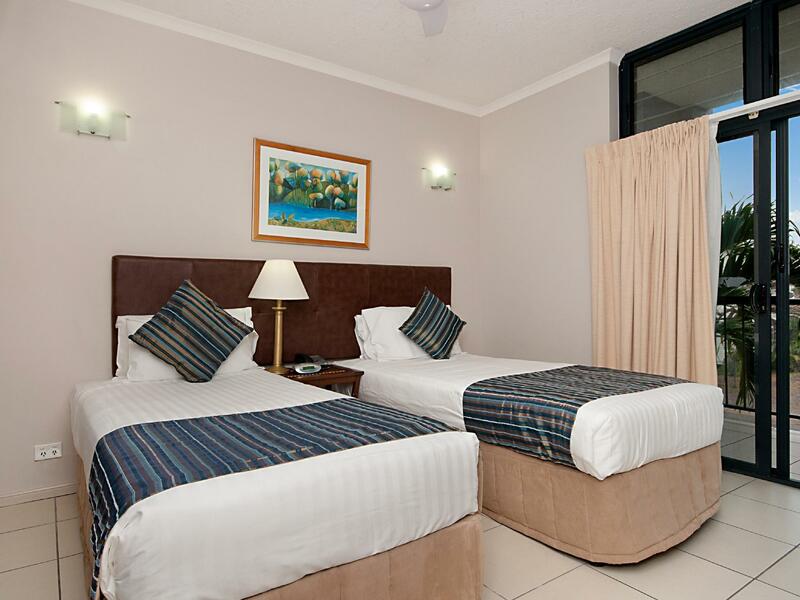 Big rooms, proximity to shopping centre and esplanade, washing machine and dryer. Good stay. Strongly recommended for family with young kids. Could easily book yours through front desk.. Professionally run. Close proximity to the Esplanade where we have access to various dining options and near the Marina Reef. stay was great. Good price for a self contained apartment. Only downside is lack of service, maybe a towel refresh would be nice, but managed to live without it. They did provide 4 towels to begin with though! Would stay here again, no qualms at all. Located maybe 15 min walk to the water, but convenient to the mall with big stores in case you need to shop. Location is great, good pools, shops and eateries nearby, short walk to the beach promenade and reef terminal. Apartment was clean and spacious, front desk staff were very helpful. Only con is the noise in that you can easily hear neighbors thoughout the complex. The apartments are very well appointed and comfortable. I had a one bedroom deluxe which included a dishwasher and washing machine. There was a lovely terrace with a large dining table and very comfortable rattan sofa. 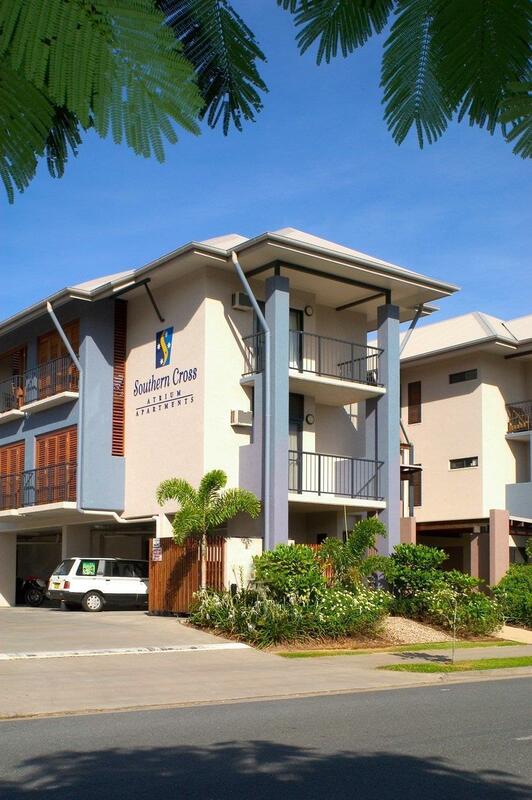 Very close to the Cairns Central shopping mall and railway station. About a 15-20 minute walk down to all the eateries and life on the esplanade. I would definitely stay here again. The only down side is there are no lifts and access to all units is by stairs. Our 5 nights stay is highly affected by the traffic noise during night time and the rubbish collection vehicle in the early morning because the room is close to public road. The front desk staff requested expensive cleaning fee on top of upgrade room charge if we need to change our room on the remaining days. Also, it is unacceptable that without any cleaning for 5 nights stay (but it may be the culture in Australia). The facilities are old and there are noise from the air-condition system. We could'n sleep as the studio apartment is located approximatly 6 or 7 meter from the busy road. I asked to move to the other same room, it was said not available . And the staff checked the booking then said, you booked thru Agoda, and this is the room (booked thru Agoda??). I asked is there any different if I booked thru the other travel agent? I have no idea, what deal did Agoda have with Atrium. Its not worth my money to stay at Atrium. Stayed here for 6 nights and overall had a very nice stay. Great location near main strip of town. Stylish, clean and comfortable room. Would stay again. However oddities I found were: - we were only provided one tiny bottle of shampoo and this was to last for 6 nights. No conditioner provided - they don’t come and make up your room if you’re staying less than a week, so no fresh towels or room / bathroom supplies provided. - when waiting to talk to the hotel receptionist, I witnessed a couple being charged for a new box of tissues as they had run out in their room. I know our room certainly wasn’t provided with a new / unopened box of tissues so it’s surprising this hotel would go to the extent of charging for small things like that. -Cairns also doesn’t seem to believe in fly wire and the room only had window shutters that opened directly to the outside. -pools and spa are not heated and were so cold! - we had a studio apartment with cooking appliances but no oil.